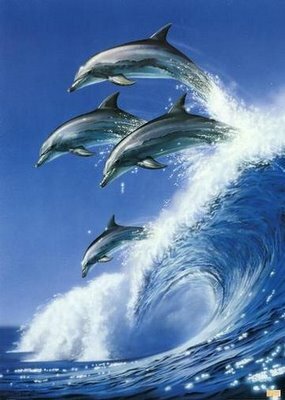 Dolphins are amongst the most adorable as well as the most intelligent marine animals. Belonging to the Animalia kingdom, they are quite closely related to whales and porpoises. Found all over the world, they mainly occupy the shallower seas of the continental shelves. It is believed that dolphins evolved around ten million years ago, during the Miocene. They have a beak-like snout and sharp, conical teeth. However, it is their friendly appearance and seemingly playful attitude that has made them one of the most popular mammals, as far as humans are concerned. Dolphins have to be conscious to breath. This means that they cannot go into a full deep sleep, because then they would suffocate. Dolphins have “solved” that by letting one half of their brain sleep at a time. This has been determined by doing EEG studies on dolphins. Dolphins sleep about 8 hours day in this fashion. 3. rest on the bottom (in shallow water) and rise to the surface every now and then to breath. The short answer to this is that we do not know. There is no reliable method to measure intelligence in humans across cultures, so it is not surprising that comparing humans, dolphins, apes, dogs, etc. is impossible. There are some indications of their potential: they are fast learners and can generalize (which is also true of pigs). Also they can learn to understand complicated language-like commands (which is also true of the great apes). Bottlenose dolphins eat several kinds of fish (including mullet, mackerel, herring, cod) and squid. The compostion of the diet depends very much on what is available in the area they live in and also on the season. The amount of fish they eat depends on the fish species they are feeding on: mackerel and herring have a very high fat content and consequently have a high caloric value, whereas squid has a very low caloric value, so to get the same energy intake (calories) they will need to eat much more if they feed on squid than if they feed on mackerel or herring. On average an adult dolphin will eat 4-9% of its body weight in fish, so a 250 kg (550 lb) dolphin will eat 10-22.5 kg (22-50 lb) fish per day. The maximum age for bottlenose dolphins is between 40 and 50 years. The average age a dolphin can get (the life expectancy) can be calculated from the ASR Annual Survival Rate (the percentage of animals alive at a certain point, that is still alive one year later). For the dolphin population in Sarasota Bay, the ASR has been measured to be about 0.961. This yields a life expectancy of about 25 years. For the population in the Indian/Banana River area, the ASR is between 0.908 and 0.931. This yields a life expectance between 10.3 and 14 years. So the actual life expectancy differs per region.